Thanks to all the testers of world wonders, especially Fenix who tested it very comprehensively. Cant see the login screen from the home page when using a proxy server. No place to log in or enter the game. Is it the proxy, or is it a bug to be fixed? Can't play unitl it is. Thanks. did you had a disconnect yesterday in the game or was there any other reason? I would like to help you. You can also write me an email to info@strategymania.com or just ping me at LINE conqueror group. Not quite sure of this but I noticed the game processes things faster, possibly due to the new server? e.g. I can join games faster, shift through the spots before a game starts faster, etc. Maybe it's just me however I thought I'd point this out. Thanks for this bug report. I will dig into it when i have some time. It is pretty essential. I just checked that. It is a bug, It is fixed in the next version. In some situations one seems to get "extra gold" out of blue. That happened to me and Chuck atleast. We noticed that in the 2vs2. In different games both of us got some extra gold and we weren't doing taxes or capturing lands. And it was Old Europe so no WWs. It's either related to buying an advance in the land or getting your land advanced - I think, not sure. Has anyone else noticed something like this? Or is this a new feature (I hardly think so)? 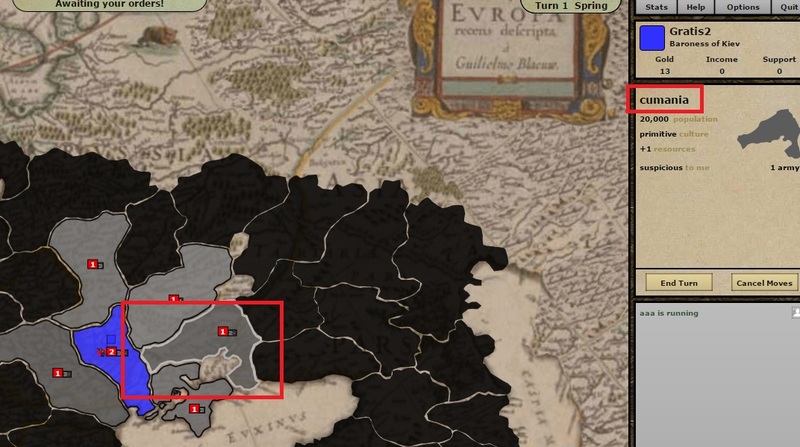 In the new map (Europe 1200), the province called Cumania has the little initial letter in it's name.